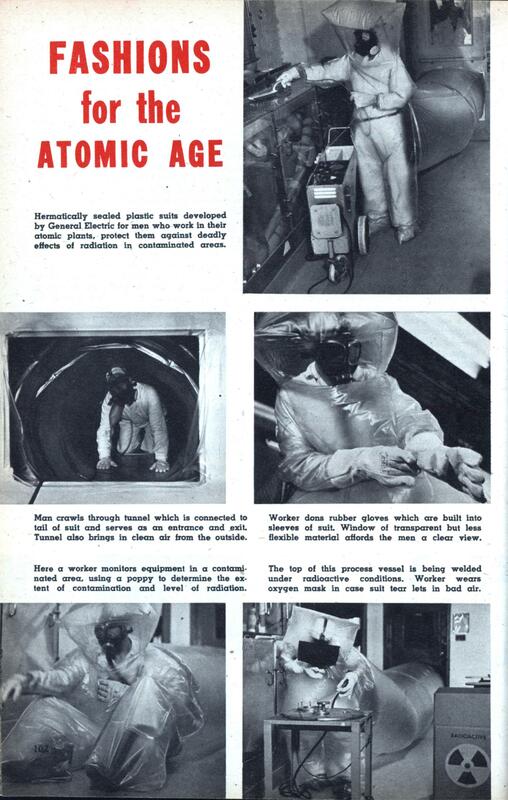 Hermaticaily sealed plastic suits developed by General Electric for men who work in their atomic plants, protect them against deadly effects of radiation in contaminated areas. Man crawls through tunnel which is connected to tail of suit and serves as an entrance and exit Tunnel also brings in clean air from the outside. Here a worker monitors equipment in a contaminated area, using a poppy to determine the extent of contamination and level of radiation. Worker dons rubber gloves which are built into sleeves of suit. Window of transparent but less flexible material affords the men a clear view. The top of this process vessel is being welded under radioactive conditions. Worker wears oxygen mask in case suit tear lets in bad air. I hear these are all the rage in Fukashima this year. As seen in the motion picture ‘Andromeda Strain’.